Door: Total thickness 100mm. 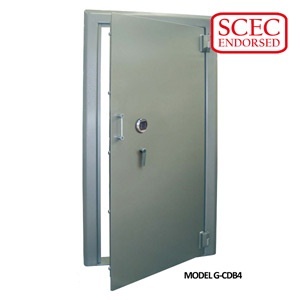 The “Security” door provides a heavy steel front section supported by drill-resisant hardened plate over all vital lock areas, c/w two relocking devices. Bolt work: Heavy 25mm dia. Bolts of high grade steel provide two-way locking into the specially strengthened lock chamber section at front and rear edges of the door. Locking: A high quality one million change combination lock and a six lever pick resistant key lock. Frame: Heavy steel frame 125x125x6mm with 125x18mm threshold plate at bottom. Fire Resistant: Fire pan fitted to rear of door with approved high fire resistance compound.